My journey to becoming a coach. I started running about 18 years ago, I'd always wanted to run, I had looked at runners and wondered if it was something I could do. When I moved down South from the North 20 years ago I used to throw myself around the aerobics class at Fareham Leisure Centre, mainly because they had a creche and it meant I could have some peace and quiet without my kids. My aerobic's friend and I decided to give running a go and we had a 3 mile loop that we ran twice a week, it nearly killed us but slowly we get better and improved, signed up for a 10k and just said, well we'll have to do our loop twice now. No one coached us, we just got on with it and it was great, we both caught the bug. We'd heard that Fareham Leisure Centre were starting a running club so we signed up, it was brilliant, we met a small group of people every Tuesday evening and ran around Fareham, this was the beginning of the now very successful Fareham Crusaders, I was part of those early days, it was so exciting and I remember us all being asked about what name we should be called. My friend got told off as she entered a race using Fareham Crusaders before it became official and affiliated with England Athletics. I stayed there for about a year and then moved to Stubbington Green Runners as their nights were more convenient for me. I cut my teeth with Stubbington Green Runners (SGR), again it was a very exciting time in running, we entered really interesting races and I experienced lots of different terrains, road and trial and saw some beautiful southern countryside. 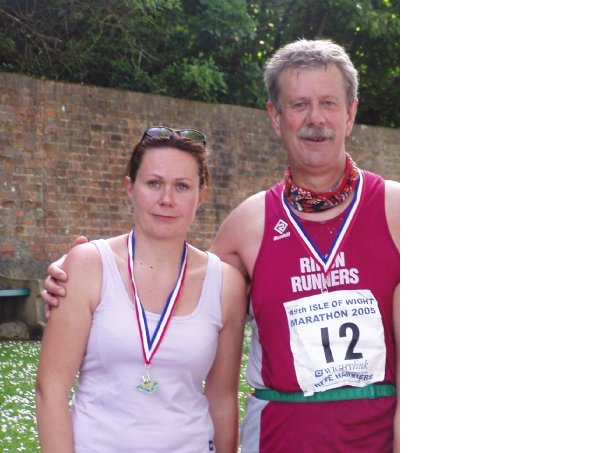 I entered the Isle of Wight marathon in 2005 to celebrate my dad's 60th birthday as he wanted us to run it together. I'd never been to the IOW before and was a bit surprised by the hills. I think I was a bit shell shocked at the finish. I joined SGR committee in 2009 and went on a Leader in Running Fitness course and absolutely loved the structure and ideas that were being developed by England Athletics and put these into practise with the club. Again these were really exciting times, we were attracting numbers that we hadn't seen in a long time, there was a real buzz around running again. I then started my Coach in Running Fitness qualification and I just loved it. I remember years befoe when I first started running asking someone how you get faster, their response was to just imagine that someone is chasing you! It didn't work for me, I just got hot and sweaty and felt sick so I didn't run any faster. However, doing the CiRF course was like a light bulb moment, here I was, just a normal 40+ women with an opportunity to get faster. I learnt how to run more effeciently, what runs I should be doing, how often I should be running. I learnt about pacing, about nutrition, about just getting the basics right. I loved it! and guess what? I got faster! It was amazing! I took charge of the beginner's course at SGR, it was an annual event and I was the point of contact. People were messaging me all the time, sharing their fears about running, could they do it, would they hold people up, they didin't want to be last or left behind. The satisfaction I got from watching people progress, just like I did, with the right coaching was unbelievable. I became the club coach and I just loved it, people were improving by learning the right techniques, experienced runners times were dropping and I was being asked advice. I was in my element. I even won "Contributor of the Year" at the Annual Awards night in 2013. I started to have ideas about making a living out of being a coach, I was a teacher of Psychology so I knew a bit about managing large groups, I loved running and I loved coaching people, could I really turn this into a business? I started with a name, an idea and an email address; I offered a 8 week beginner's course that I had designed myself from my own experience and the theory I had learnt on my coaching course. I started with a group of 4 people in September 2014 and taught them how to run from being a non-runner to a runner, it was brilliant. People wanted to stay with me though and have me as their coach and this is how RunVerity developed. I gave up my teaching job in May 2016 and have concentrated on RunVerity full time since then and we are growing and learning together, it is amazing and I feel so lucky to be able to get up each morning and do a job that I love and make a difference to people's lives. I worked out yesterday that I must have taught over a 1000 people to learn to run, isn't that just fab? Newer PostThank you Verity, Never knew I could run!